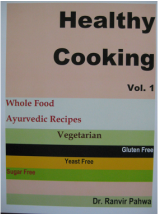 It is a collection of delicious and balanced recipes created on the philosophy of Ayurvedic diet. The recipes are time tested. It contains food categories based on the body types (Doshas). It contains table to determine ones constitution. Why soak and cook pulses? Book received admiration from several of my patients and customers, where some recipes from the book have made a place in their kitchens.